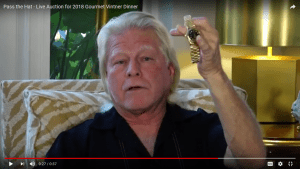 Auctioneer Jon Finstrom describes “Pass the Hat” – Neighborhood Health Clinic, Inc.
Once again, Jon Finstrom is our Vintner’s Dinner Auctioneer. Jon and his fiancé Linda Geba enjoy volunteering their time and resources to local charities such as the Neighborhood Health Clinic. Last year with a lot of great support from people like you the auction raised over $1,000,000.00! It is Jon’s goal to top his total from last year. 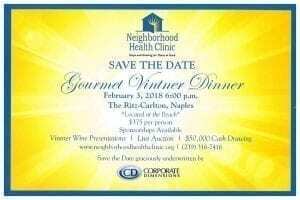 Jon asked us to skip his bio and ask you to please give generously at tonight’s auction and throughout the year to allow the Clinic to continue the remarkable service that they provide the citizens of Collier County. Cheers, bid high and bid often!